While the weather outside might be frightful, you'll find that being inside, at a home show, can be delightful! You'll discover what is new and innovative in the building industry when you stop by any of these fun events. It's the perfect time to meet face to face with one of our SIP experts at a home show or event near you. It's the perfect time to get started on your summer building project! At the Enercept booth you will be able to gain a better understanding of SIPs and how they can work for you. 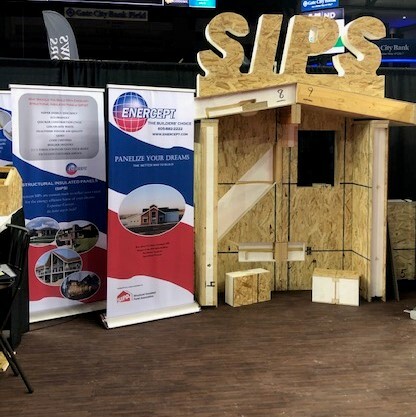 You'll be able handle our structural insulated panel samples, view large photo galleries of projects we've been a part of, and talk to our SIP experts one on one. They will be able to answer your questions and offer suggestions for you next building project. In March, we will exhibit at over 15 events, including the second big weekend at the Minneapolis Home & Garden Center. Enercept will be attending home shows and events well into May. But, if you're not able to catch us this spring, the fall season will be here before you know it - we've already booked our first fall engagement, The 2019 ALA Midwest Architecture Conference in Oakbrook Terrace, IL.